Wippermann will present the latest generation of maintenance-free chains at the HANNOVER TRADE FAIR from April 24-28. The broad range of our high-performance chains is characterized by the high modularity of the components, which enables the configuration of the chain for customised drive solutions with optimum performance that are precisely geared to the customers’ requirements. In particular the new polymer bearing TRIGLEIT II supplements the range of applications in corrosive environment, such as in the case of permanent water contact. The latest generation of maintenance-free chains testifies to our high technological standards in terms of wear and fatigue resistance as well as corrosion and temperature resistance. The use of high-grade steels, environmentally-friendly and food legislation-compliant functional coatings as well as innovative polymer bearings form the basis for customised drive solutions which cannot be lubricated for technical or economic reasons. Our six high-performance versions cover a wide range of operational performance. In particular the new MARATHON RF with TRIGLEIT II polymer bearings ensures exceptionally long service life in dry running operation and permanent contact with water. Maintenance-free high-performance chains, RoHS-compliant and with FDA approval also for lubricant-free use in sensitive production areas. The new MARATHON RF offers a broad range of applications including dry running operation, permanent contact with water and applications with chemical substances thanks to extremely durable, low-friction polymer bearings. In addition to the pre-configured chains, our modular system also provides for the individual configuration of maintenance-free chains according to specific requirements. For every application, Wippermann offers high-performance chains that are suited for use under high mechanical load and in high temperatures, in permanent water contact and in environments that are subject to hygiene and food regulations. 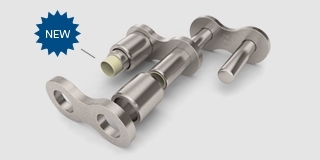 Thanks to decades of experience, comprehensive technological expertise and a high level of innovative power, companies in the electrical, food, packaging and automotive industries can rely on maintenance-free chains by Wippermann. Versatile engineering services and individual application advice round off our range of services and make us your reliable partner for all challenges related to your drive system.